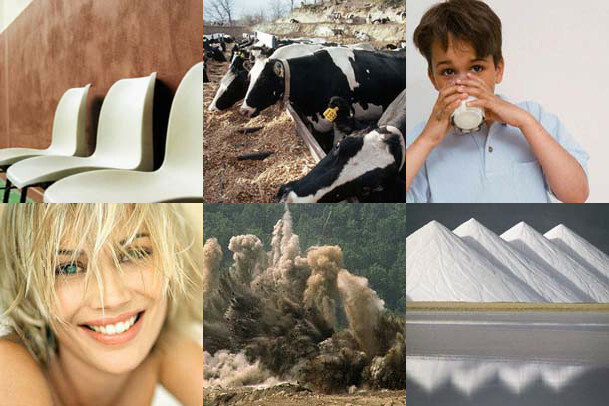 Calibre's products have a variety of applications. These include pharmaceuticals (as APIs, intermediaries, in x-ray contrast media, for iodination, production of cephalosporin, lamotrigine, radiation emergencies, thyroid disorder diagnosis & treatment), in cosmetics (hair bleach), as polymerisation initiators, as heat stabilisers (PVC, Nylon), as nutritional additives (animal feed, salt iodization, dough conditioners, baby food), in the glass industry (colourants, decolourants), in emulsion explosives (mining), solid propellants, pool treatments, paper pulping, airbags, polarizing films (LCD), fracking (delayed gel breaker), oil exploration, as oxidizing agents and several other applications. Uses pictured here (clockwise from top left) as polymerisation initiators, animal feed, human nutrition, salt iodization, mining explosives and hair bleach. Iodine is an essential trace element for animals and humans. It is incorporated into both of the thyroid hormones. These regulate cell metabolism and growth, transmit nervous stimuli and factor in brain development. Calibre is involved with a number of innovations in this industry. e.g. the efsa (European Food Safety Authority) Calcium iodate Scientific opinion on safety of calcium iodate (E2) based on dossier by Calibre Europe (click to view in a new window). Selenium is needed by humans and animals for the maintenance of normal hair, maintenance of normal nails, protection against heavy metals, maintenance of normal joints, maintenance of normal thyroid function, protection of DNA, proteins and lipids from oxidative damage, and maintenance of the normal function of the immune system. Calibre's Potassium persulphate is specifically engineered for use in hair bleach. Ammonia-free: Calibre's potassium persulphate is manufactured by the electrolysis of sulphate. COnsequently it has zero ammonia. Fine (small) particle size: Calibre's potassium persulphate's crystals are formed at electrodes. Consequently their particle size is uniform (low vaiance) and small. This removes the need for milling / grinding before use in formulations. A similar bleaching / oxidising effect is used to remove the colour from paper pulp. It particularly suitable for pulp with high resin content as the relatively low solubility of potassium persulphate (as compared to alternatives) allows it to sit longer on the surface of the process. Sodium selenite when added to glass gives a pink colour which balances (removes) the colour caused by impurities in glass.